After a lengthy period of not owning a Jeep, I would like to correct this mistake. My interest lies in the used 2008 Jeep JKU Sahara AEV built w/ 5.7 Hemi. What would you estimate the price of such Jeep with AEV conversion kit (3.5” lift, Bilstein shocks, bumpers w/winch and tire carrier, etc. ), aftermarket sound, and newer 35” Nitto ridge grapplers. Would you say 28k sounds too much or appropriate? I would truly appreciate your opinions. P.S. Around 2014 I used to be a member of this forum under nickname kiton, but cannot access that profile now (will try to fix that with administrator). I am trying to recover it. Update: Moderator, would you please consider my request on account recovery (I sent a PM, but got no response). Last edited by 1862507; 03-05-2019 at 05:54 PM. 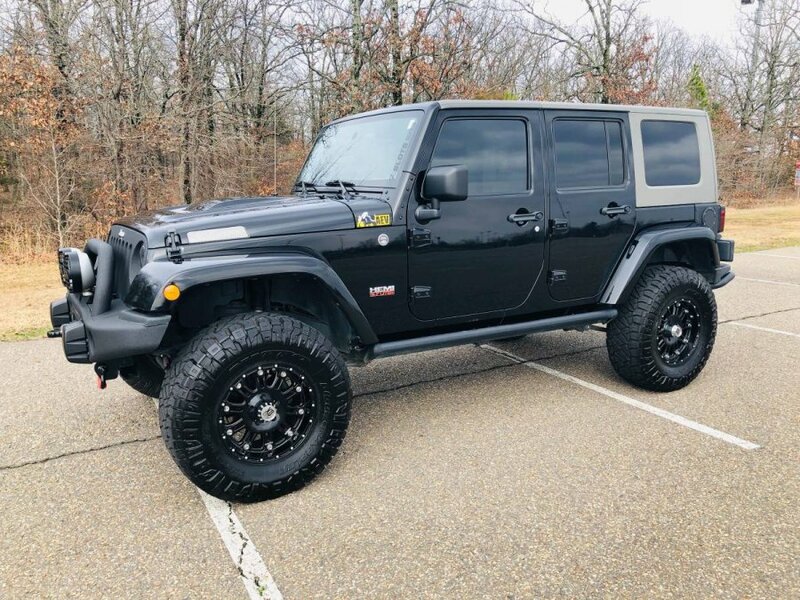 Assuming an excellent condition stock 2008 JKU Sahara with mileage around 40,000 would cost in the upper range of $18,000, a somewhat modded version of such vehicle would be around 22-24, depending on other factors. If you consider higher end components used, then the number could go slightly up. Is my logic correct so far? Coming back to my original question of pricing an AEV with a V8, it seems that what ever else is added on top of this price would be for the motor basically. The question is then how much am I willing to pay for the V8 on a Jeep, right? I'd really appreciate some opinions, as I am seriously interested in the Jeep, and yet try to be cautious with overpaying. In general, doesn't the idea of a HEMI V8 in a Jeep sound great? Especially given the reputation of AEV and no "rebuild" title among other things? MODs to the vehicle can either appreciate or depreciate the value. It depends on how professionally they are done. I personally prefer an unmolested vehicle. JS. @Boojo35 I cannot agree more with you on this. In case of AEV-conversions dot com, I was under the impression that they do high quality work (authentic, and yet not highly deviating from original). Howdy That's really me writing from the original restored account! I realize the price of 28k might be in the upper limit, but you really don't see many HEMI's on the road especially with such mileage. Having said that, would you still consider buying the Jeep assuming everything else checks out? Thank you for your opinions. I also include the image of the Jeep below. Well, is it worth $10K to you? 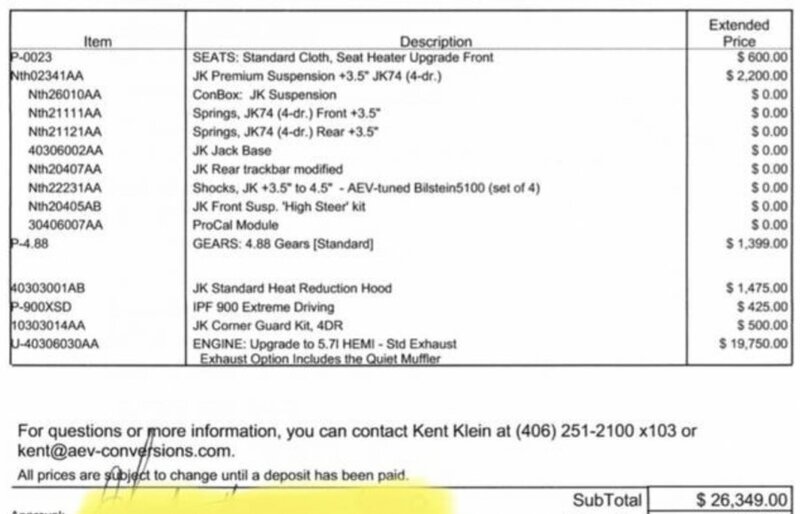 For a hemi conversion, a $10K premium is expected. AEV does a nice job and most likely, it hasn't been modded by Bubba. It would be helpful if we knew all that was done to that one by AEV. To me, it would be absolutely worth it IF it was a Rubicon. To me, the Sahara is more of the soccer mom version. However, you are not me, so if you like it and the price is not an obstacle, go for it. While it's an 08, it doesn't have the 3.8 in it and I believe it does have a D44 front axle. @cranbiz thank you for your response. I would like to make a present for my wife -- and she is technically a swim mom Therefore, I personally wasn't looking for a Rubicon, although I hear you. In addition to other modifications (like wheels, tires, sound, power running boards), the Jeep has got an AEV conversion pack -- I include a list of mods below. An unmolested Sahara is in the ballpark of $14-16K these days. The gears are good, the lift and shocks are good quality. It appears that it still has a D30 in the front as there is no mention of swapping that out. I'm assuming it's the auto 42RLE transmission. It's not horrible, it was put in RAM pickups with the Hemi. If it's basically the mom taxi, I think you might have a winner here. It looks really nice, it has the power and the gears for those 35's. It will be the baddest vehicle at the pool. Rule of thumb is you might get back 25-50% of the mods value when you sell and that's subjective to the buyer. So in this case, you are paying less than 50% of the cost of the mods. The Hemi is easily worth that by itself. This is all my opinion, others will think otherwise. I think it's a quality setup, done by a company that does these conversions all the time and as long as it hasn't been beaten on, it's low risk. It comes down to you and your missus. If you like it and it runs and drives well and if you think she will like it and you can swing the cost, then go for it. @cranbiz I truly appreciate your feedback and opinion. Thanks! I would say that price is on the high end but for a clean low mileage Jeep probably worth it. It was most likely sent to AEV before it hit the showroom and was probably 60k or so new. I would make sure it was an AEV build, should be an AEV ID tag on the pass. door jam with a s/n on it.